Durable marine wax protection � in a spray! Marine 31 Gel Coat Spray Wax Plus is an easy-to-use spray on boat wax that provides exceptional UV protection and a slick, high-gloss finish on your boat�s gel coat surfaces � standard and painted. Formulated using real carnauba wax and protective polymers, Marine 31 Gel Coat Spray Wax Plus provides the utmost in surface protection while only taking minutes to apply. Regular application will keep your boat looking new and protected against salt degradation and UV rays. Marine 31 Gel Coat Spray Wax Plus breaks the mold of traditional spray-on boat waxes by providing the protection and shine that used to be reserved for a liquid boat wax. Marine 31 Gel Coat Spray Wax Plus is formulated using real carnauba wax, protective polymers and advanced UVA and UVB absorbers, all designed to keep your gel coat looking new and protected. What�s more, Marine 31 Gel Coat Spray Wax Plus will not stain rubber trim! Time is of the essence! Marine 31 Gel Coat Spray Wax Plus is the next best thing to a traditional liquid boat wax, like Marine 31 Gel Coat Carnauba Wax + Sealant. In minutes you can protect your boat while imparting a high-gloss, slick finish. Boats that see regular application of Marine 31 Gel Coat Spray Wax Plus will be far easier to clean and maintain in between regular washes; water spots, oil and boat scum will be much easier to remove. 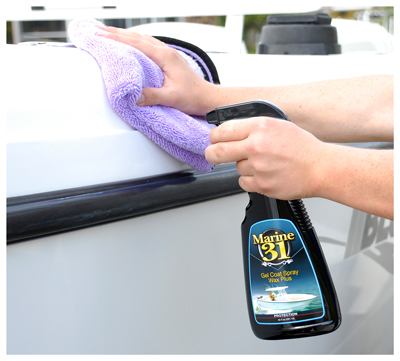 Avoid gel coat oxidation and regularly treat your boat to Marine 31 Gel Coat Spray Wax Plus. Marine 31 Gel Coat Spray Wax Plus is harbor-safe and eco-friendly. Only apply to clean surfaces outside of direct sunlight. Ensure surface is cool to the touch. Working one section at a time, spray a fine mist of product directly onto surface and lightly buff with a clean, dry microfiber towel. Apply a second coat to ensure even coverage and maximum protection. Repeat steps 1-3 until entire boat is waxed.